BANGI, 7 Nov , 2012 – The missing link in the development of Malaysia’s Small and Medium Enterprises (SME) may be due to the lack of leadership and political patronage. Economist Tan Sri Datuk Dr Kamal Salih, an Adjunct Professor of Economics and Development Studies at Universiti Malaya, said SMEs can thrive if the people leading the businesses have the necessary calibre and mettle. 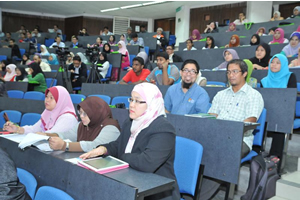 Delivering his public lecture on entrepreneurship at The National University of Malaysia (UKM) today, he said starting small or medium businesses from scratch, like other enterprises needs merit and enough capital. Unfortunately there was not enough capital as the funds available were distributed too thinly on the ground while the heads were selected on the basis connections rather than merit resulting in 90% of SMEs that were started with public funds failed. Yet policies of starting up such firms have not changed very much in 30 years explaining when the so-called “Big Push” for developing home-grown talent to start up SMEs began in the early 1980s, there was the tendency to pick the heads based on connections rather than merit resulting in having leaders lacking in experience. Prof Kamal compared Malaysia’s experience with that of South Korea. Both nations embarked on the “Big Push” at about the same time 30 years ago, starting with their GDP per capita at an equal US$8,000. South Korea, however, made more progress and soon surpassed Malaysia with its GDP now at the OECD (developed nations) level of about US$32,000 per capita, more than double that of Malaysia’s. Many economists had credited South Korea’s success to its many flourishing SMEs rather than the giant Chaebols, or family-owned conglomerates. He said in order for Malaysia to reach developed nation status by 2020, it needed to double the people’s income in seven years. The present gap between the two countries is even more telling despite South Korea’s lack in natural resources and has to import all its raw materials. Prof Kamal said lessons should have been learnt that any business development would benefit from indigenous technology and know-how. However, then as now, Malaysia relied too much on Foreign Direct Investment which involved various demands. The foreign investors have their own agendas and there was also a general failure to transfer technology. 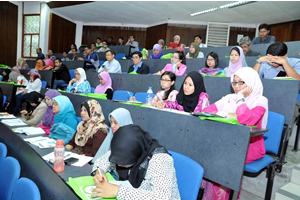 The public lecture was organised jointly by UKM’s Faculties of Economics and Management, Social Sciences and Humanities and Centre for Entrepreneurship and SMEs Development (CESMED-UKM) on Capitalising Innovation and SME Development: The Missing Link in Going Global. 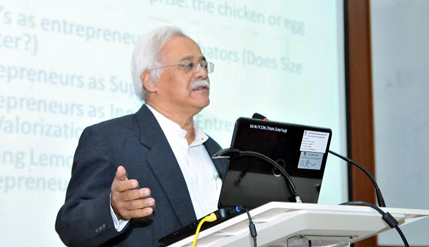 Prof Kamal said the mainstay of the economies of many industrialised nations are the SMEs which he described as the test-bed of entrepreneurship. Prof Kamal, born in 1946 graduated with BA (Hons) from Monash University, Australia and gained his PhD at the University of Pennsylvania in 1973. He was the founding Executive Director of the Malaysian Institute of Economic Research (MIER) from 1986 to 1994. As Economics advisor to the government, he became the Rapporteur-General of the first National Economic Consultative Council (NEACC) between 1989 and 1991 and the National Implementation Task Force from 2006 to 2008. In 1992 he established the first private medical college now known as the International Medical University (IMU) and remained its Executive Chairman until 2004. He was also an elected member of parliament for Wangsa Maju in Kuala Lumpur from 1996 till 1999.